From skinny to buff, Ralston D’Souza transformed his body and became his own sculptor. From sticking to a diet to weight training, he checked all the boxes and went from a skinny boy to a Competitive Physique Athlete. 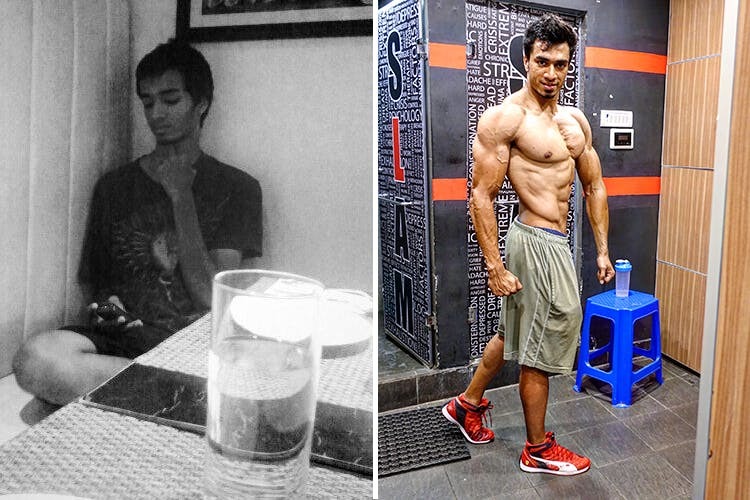 At the age of 20, Ralston D’Souza found himself to be a lean and skinny guy just like so many others. Due to the influence of a friend he began going to the gym and discovered a passion. As he felt and saw his body change according to the way he wanted it to, he also fell in love… with his body, of course! Then, with some research on bulking up and eating healthy, he began to get into this full-time and ditched his prior aspirations of being an accountant. And soon, he had a body worthy enough of being a Competitive Physique Athlete! Ralston works out at Slam Fitness and Lifestyle Studio in Indiranagar four times a week religiously. When preparing for a competition he customises his workouts and prepares his body for it. However, on a daily basis, he makes sure that he gets 15 minutes of cardio, 45 minutes of weight training and weight lifting and ends with 15 minutes of stretching. His mantra is good healthy food and a lot of weight lifting. He went from a mere 43 kgs to a nice buff 94 kgs! Wow! If he can do it so can you! Or well, at least we can try right! Ralston strongly believes in a healthy diet and makes sure that he includes meat, oats, eggs, sweet potato and a small amount of fruits in his diet. For muscle building you need a good amount of carbs and proteins to help your body develop and so he follows a calorie based diet. On the days that he trains he maintains a 3,200-calorie diet per day and on non-training days he maintains a 2,800-calorie diet. Throughout the day he counts his calories and therefore loves restaurants that give you a calorie count. His favorite food places include Hwealth Café in Koramangala, Calorie Kitchen and the steak at The Only Place. Ralston is a personal trainer and an online coach when he is not training for a new competition. He helps people with their fitness through Skype sessions and occasionally trains people at Slam as well. He is currently preparing for the Ameteur Olympia on October 13 in Mumbai, which is the biggest and first international competition to take place in India. So, if you need some inspiration and want to follow in his footsteps, you know where to find him!